Psychiatric service dogs assist people with psychiatric disabilities, including panic disorder, post traumatic stress disorder and depression. These dogs are trained to perform certain tasks to help alleviate the symptoms of a psychiatric issue. Whether caused by PTSD or a panic attack, people who experience a sudden onset of fear can experience respiratory distress and other crippling side effects that render them temporarily incapable of accessing their medication. Psychiatric service dogs are able to retrieve the medication and bring it to the person. They can also bring a beverage to make it easier for the person to take their medication. In the case that someone needs help but is unable to get to the phone, a psychiatric service dog can be trained to retrieve the telephone and bring it to the person to dial for help. If someone experiences symptoms of a panic attack or other psychiatric disability that leaves them unable to seek help on their own, a psychiatric service dog can be trained to alert a family member, friend or co-worker. For people who experience dizziness as a side effect of medication, a psychiatric service dog can provide support when using stairs or standing up. Large dogs are best suited for providing this type of service as they must be able to support at least some of the person's weight. Some medication for people with psychiatric disabilities causes them to be heavy sleepers and they may not awake at the sound of a fire alarm or alarm clock. A psychiatric service dog can wake them by nudging or gently tugging on them. Someone with PTSD may need assistance feeling safe, even in their own home. Psychiatric service dogs can help by turning on lights or searching the room before the person enters. If everything is clear, the dog will return to the owner and provide reassurance that everything is okay. What are the Psychiatric Service Dog Laws? Psychiatric service dogs are covered under the Americans with Disabilities Act and receive the same rights as service dogs for people with physical disabilities. The laws for psychiatric service dogs according to the ADA include that they are allowed to accompany their handler to any public establishment. An emotional support dog is not considered to be a psychiatric service dog. 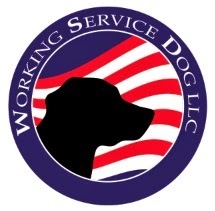 Although they may offer a sense of comfort and security, they have not been trained to specifically perform a task and are not included in the service dog laws under the ADA.